From first-time Equine Experiences and introductory lessons on the farm to full scale training and competing at local and rated horse shows, we provide a range of services to allow you to enjoy horses…yours or ours…right here in western Kentucky! 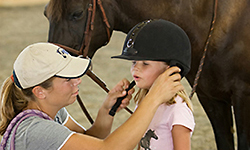 Our goal is to bring horses and horsemanship into as many lives as possible through our various services and programs. Let us know what you are looking for and we will do our best to accommodate your needs! We have something for everyone at Blue Moon Stables! Everything is by reservation only, so we can give you the best experience possible! Whether you are looking for a new leisurely pastime or aspire to compete, private, semiprivate and group lessons are offered for all levels of experience. Focus is on balanced seat and horsemanship. No experience necessary! We love to share our passion! Our experienced instructors will show you around the farm and introduce you to our herd of equines. Hands-on activities included, no experience required. By reservation only. Enjoy 100 acres, 18 stalls and an indoor and outdoor arena with top-notch horse care. Training available. We are one of the only stables around that offers a lease program with our lesson horses or sale horses. Supporting equine goals with or without competition. Supporting local 4-H, FFA, Pony Club and Scouts as well as local riding clubs. We host clinics, horse shows and educational days to support Blue Moon success and the success of the local horse enthusiasts outside of Blue Moon. Volunteer and participate.